Have you ever seen those commercials for a certain law firm that exclaim, “It’s my money, and I want it now! !” This pretty much sums up our nation today. 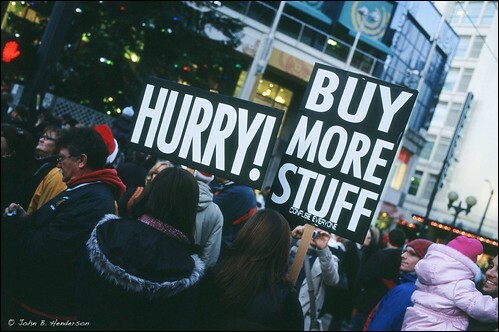 We are all scrounging for the next materialistic item, and we don’t want to wait for it. We want it now! Credit cards are in the wallet of nearly every citizen (including children) – many of them with a balance. And, much of the furniture, televisions, and appliances are technically owned by a bank somewhere. Why is it that we buy things that we cannot afford, but we assume we’ll easily pay them off later? Mainly, it’s because the message of instant gratification surrounds us everywhere we go. Credit has made it incredibly easy to get the things we want, but often times it becomes the ball and chain of our financial future. If we allow ourselves to purchase items on credit, our payments increase, which obviously causes our cash flow to decrease. And, with a reducing cash flow, we can easily get trapped in our debts with no way of escape except for making those many future payments. Once we pay off the debts, the furniture, appliances, and electronics that we bought on credit are now worn out and need replacement. But, since our cash flow was down, we were unable to save money. So guess what? We need to go back into debt in order to make that next purchase, and then the cycle continues. In the end, you’re left with very little money in your investments (if any), hardly any savings, and you have a houseful of old stuff that might still have some future payments scheduled. In my opinion, this is not the way to live. What if we took a drastically different approach? What if, instead of purchasing our furniture over the course of 36 months at a low interest rate, why not save up some money for 2 or 3 months and buy something a little less expensive? Then, once the furniture is purchased, there is still a positive cash flow for something else – maybe even some investments! By delaying your gratification and not buying things on credit, your future could be noticeably different. Everything in your house will be paid for, you’ll have money in the bank, you’ll have investments that are increasing exponentially, and you might even have some passive income that earns money while you sleep! So, the next time you’re tempted with a purchase (big or small), remember to think twice about it and consider what it might do to your future. Chances are, if you delay the purchase, your future will be much better off. Have you ever made a purchase on credit that you regretted later? Do you live your life with the delayed gratification approach? I really regret buying my wife’s vehicle in 2009. It’s paid-off now, but it really set us back. I think for some things that are really important, like travel, I’m willing to delay a bit, but I am happier working them into my plan by saving incrementally. I couldn’t agree more! I hate seeing my own family fall into these money pits. Yep. There are a few members of my family that fall into the “instant gratification” trap as well. It really is sad to see. We really do live in an age of instant gratification. Why save up, when you can just charge it and have it today? When we were paying off our credit card debt, I REALLY wanted a DSLR camera. We were almost done paying it off and I knew that if I got the camera, I could have it paid off quickly. I wanted the camera in time for autumn. But. I knew it would be stupid to buy it. It wasn’t an emergency and there wasn’t a big sale. I waited until we had the cash (not THAT long later) and bought it. It felt way better to purchase it that way, and from then on we never bought anything we couldn’t pay for immediately! Ha, J.G. Wentworth! I hate those commercials too. Good word. Haha – it sticks in my head for some reason – I guess that’s the point though, huh? …..
Oh I hate those commericals too. I always change it to “It’s my money and I want to blow it all NOW!” lol. Delayed gratification is key to getting something good out of life. Lol! I like your commercial. I completely agree we should delay buying “stuff” if we don’t have the EXTRA CASH to buy it after taking care of the necessities. But you have to be careful not to put off living your life too long (lifelong dreams, specific vacations & experiences, etc.). It’s a really tough financial line to walk. The right balance is elusive. My grandfather spent years waiting to buy a simple pontoon boat, but he passed away two weeks before he was able to launch it on the lake. He finally convinced my grandmother to let him buy it, but never got to enjoy it. My grandmother regretted not letting him buy the one thing he really wanted earlier (he didn’t ask for much). Derek- where would you say that line is for you? I think you drew the line perfectly already Dave! There’s nothing wrong with spending money on fun, but it’s totally different when you spend money on random stuff just because you have it. Let’s say I have $1,000 and I have no bills coming up. I’m walking through the mall, not planning to buy anything, and I start playing a video game. I like it so much that I decide to buy the console and a few games. At the register, the total price rings up, $600. This is an example of instant gratification and I’ll shake my head at it every time. There was no need to buy the video game system and you hadn’t even thought about buying one before that day. Just because you have the money doesn’t give you the right to spend it. I’m all about earning my fun. This year, I have a goal to earn $30k from my online ventures – if I hit it, I’m going to reward myself with something that might be worth $500 or something (I haven’t thought about what this is yet, but I’ll figure it out soon I’m sure). Then, not only is it fun when I hit the goal, but I also reward myself with a prize. Your grandpa could have done the same thing with his boat – maybe his wife would have been more receptive to hitting a goal than just deciding one day to buy that pontoon boat. I think you nailed it Emily. After about 2 weeks, we realize that the thing we “had to have” really isn’t that important to us anymore. There are plenty of shiney objects that are calling our name, but it’s best to ignore them if you want a golden retirement (instead of a SPAM retirement….mmmmm…..spam…….). I feel that delayed gratification FEELS actually much better, so much so that I don’t end up buying it b/c the delay itself feels fantastic! It does feel better. By training yourself to wait, you understand that you have the power to change your future! It’s no longer in the advertiser’s hands…. This is something that goes so much against the way people think these days. Whaaat? Wait and save money before buying?? Why do that when we can take it home today?? Any time I’m going to make a significant purchase, I try to sit back and research different options for a few days before I buy anywhere. That way I have time to find the best price, as well as determine whether or not I really need it. Love your concept of delayed gratification. When we grow up, we are hit with the instant gratification bug. If we could somehow get movie stars to push delayed gratification, we might be better off. Sadly, they probably practice instant gratification the most because money is no object. I found it hard after my wife and I paid off our debts. We knew that we didn’t owe anyone anything, but had money in the bank. It was easy to spend a little here and a little there, but now we need to be accountable to ourselves and accountable to our future. Delayed gratification is still key. Delayed gratification and searching for a cheaper alternative when you need to replace something will both help you stay out of debt and continue to improve your financial situation. Great comment Melissa! Delaying gratification certainly can keep you out of debt and it allows you to improve your future financial situation. When I think like this, it’s hard for me to buy anything. I used to have a problem with impulse shopping, in fact I still sometimes battle it, but now I have put a 2 week buffer on things. If I really want something and can still think about it after 2 weeks than I look at getting it. More often than not, I just forget. I love delayed gratification and I agree that it feels much better to have consciously wanted it enough to delay purchasing it. I’m saving up $100 a month for a trip for 2013 and I know it’s going to be a great trip because I’m not going to feel guilty about spending too much money on it. BTW, I LOVEE your site design- it’s so clean and crisp like a breath of fresh air, Bucksome! I used student loan debt to purchase furniture for my apartment when I was college. I had it for one year before I moved into another apartment that was completely furnished. And so I had to get rid of it. Prior to the move, my furniture was trucked off to my mom’s house and subsequently abused and destroyed. Fortunately for me, my student loans were manageable and the interest rates were low. Never the less, that was a mistake. Now that I no better, I don’t buy things I can’t afford to pay cash for. I’m glad to hear that you learned from your experience! I used to do this a lot. I didn’t know how to separate emotions from personal finance and spending. I am much better now though and make much better purchasing decisions. The game is a tricky one, because delay gratification long enough and you MIGHT just turn into a miser!